What’s color got to do with it? Everything, according to top forecasters! Last year, Honeysuckle (18-2120), a rich, energetic pink, nudged out Turquoise (15-5519), the previous year’s darling to win Pantone’s color of the year. For 2012, the company’s forecasters passed the crown for hottest new hue to Tangerine Tango (17-1463), an adrenaline-packed orange that decorators are already embracing as a sassy visual antidote to the malaise many Americans are experiencing this election year. “Tangerine Tango has the dynamism of red and the friendly, welcoming undertones of yellow, plus a certain amount of seductiveness,” explains Leatrice Eiseman, executive director of Pantone’s Color Institute and author of the eismancolorblog.com. “We all know that certain colors can lift our spirits,” says Eiseman, who notes that the ups and downs of the global zeitgeist play a significant role in her color-selection process. Although possibly the most well known, Pantone isn’t the only company with a color-of-the-year forecast. 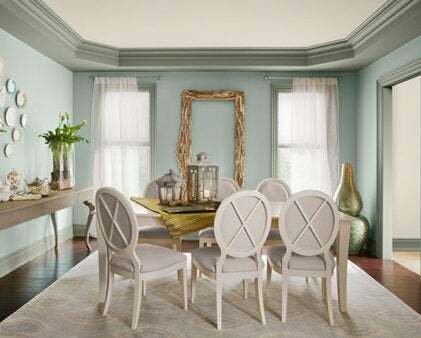 The experts at Benjamin Moore landed on Wythe Blue (HC-143), a restful blue-green with cool gray undertones, as its top pick for 2012. “It’s interesting that the color’s from our historical collection,” says Sonu Matthew, a senior interior designer with the company. “We’ve actually cited it because it has a modern edge, yet it’s rooted in history and respectful of what’s classic and enduring.” Likewise, several shades of gray, including trendy Nimbus (2131-50) and Revere Pewter (HC-172), make Benjamin Moore’s list, as do spicier, less restrained hues, like Gypsy Love (2085-30) and Persimmon (2088-40), both of which hit the bolder note of Pantone’s upbeat Tangerine Tango. 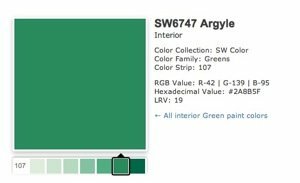 For 2012, Sherwin-Williams’ Indigo Batik (SW 7602), a deep navy blue, was nudged out of first place by Argyle (SW 6747), a true, almost emerald green that the likes of Lilly Pulitzer and Kate Spade have always kept in their arsenal. “It’s a very preppy color, the perfect blend of blue and yellow,” says Jackie Jordan, the company’s director of color marketing. “A lot of people haven’t liked it, but we’re surrounded by it in nature everyday. It’s a very basic green. People don’t fully appreciate the color yet, but I think they’ll grow to love it the more they see it.” Like Benjamin Moore, Sherwin-Williams also included a robust orange called Daredevil (SW 6882) on its 2012 hot list. So what exactly is color forecasting? Much more than meets the eye, according to Eileen McComb, Director of Communications at Benjamin Moore. “It’s a process that starts a year or more in advance. Our team of color technologists, trend spotters, and designers are constantly looking at global socioeconomic and political trends as well as what designers, architects, and manufacturers of durable goods, automobiles, and home décor are producing,” says McComb. In addition to monitoring major furniture, kitchen and bath, and electronic shows, the company’s color sleuths also keep a finger on the pulse of the latest fashions and cosmetics, as women make the majority of paint-color decisions at home. Jackie Jordan and her team at Sherwin-Williams look to pop culture for new and notable color stories, including up-and-coming artists; soon-to-be-released films; and the latest runway fashions, which oftentimes set the tone for future home décor trends. “We talk about the economy, and try to gauge our customers’ mood and how that’s going to be translated into the spaces they’ll create,” says Jordan. At Pantone, the sources of inspiration prove equally vast. “Color forecasting is intuitive but not arbitrary. We have to do a lot of homework, and we collect data nonstop,” explains Leatrice Eiseman, who considers everything from fashion and the theater to traveling art exhibitions, films, the Internet, new technology, and more when projecting which new color will get selected each year. “There’s no magic bullet. We look at what’s trendy today and what’s likely to carry on into the future,” Eiseman says. “Color forecasting definitely isn’t a linear progression,” adds Eileen McComb. “What we give people is a guide.” In 2011, Benjamin Moore’s color was a purple, this year it’s blue (Wythe Blue wall color right). “We’re not dictating to consumers, we’re just saying that a certain color is something that should be in the consideration mix if you’re thinking about transforming a space,” she adds.